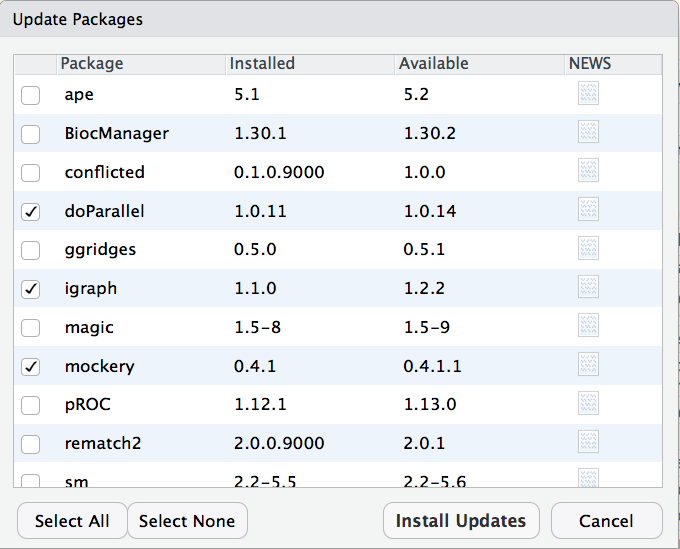 Sometimes you would like to upgrade a particular package to the latest available version. Often this is because you have heard about a new feature, or maybe you have run into a bug that may have been fixed. Devtools has a function update_packages() which will upgrade a package (from the same source) for any CRAN or development package. 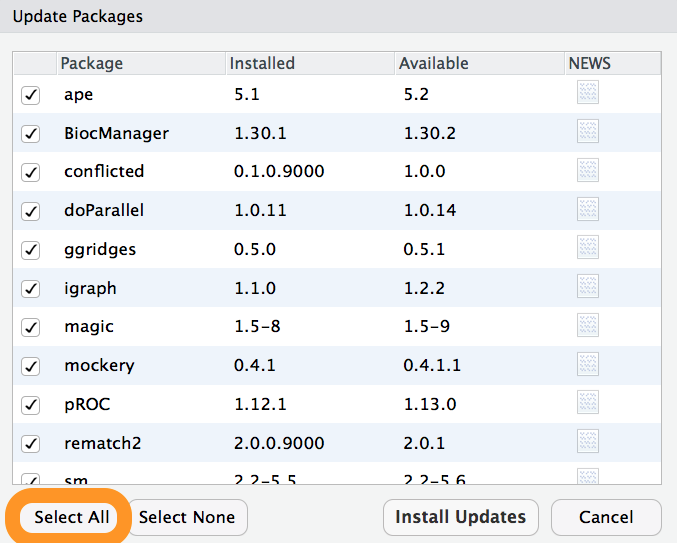 In addition if the given package is not already installed it will install it. Often you will not need to do anything when updating R. For ‘patch’ R versions, the ‘z’ in ‘x.y.z’ the R core developers ensure package compatibility across versions. So if you are updating from R 3.5.0 to R 3.5.1 you can use the same packages you are currently using. For ‘minor’ version changes, the ‘y’ in ‘x.y.z’ the package interface can change, so packages need to be re-installed. You may see some suggestions that you can just copy your packages even when the ‘minor’ version changes. DO NOT DO THIS. While it may work some (even most) of the time, R-core does not guarantee compatibility between these versions and things could break (even break silently). I suggest you keep the packages R comes with (base and recommended) packages separate from the rest of your packages. This makes it easy to re-install R if needed without touching your CRAN packages. You also want to make sure the package library is specific to the minor version of R.
R_LIBS_USER is actually set by default to this scheme, (to ~/R/win-library/x.y on Windows and ~/Library/R/x.y/library on macOS) but the directory may not already exist, so one option is just to create this directory (fs::dir_create(Sys.getenv("R_LIBS_USER"))). You can also alternatively set R_LIBS_USER to a different path; but make sure to include the %v wildcard. e.g. ~/R/library/%v. The %v is automatically expanded to the major and minor version of R, so with R 3.5.1 this path becomes ~/Library/R/3.5/library. See Renviron for how to edit your .Renviron file. Paths in R_LIBS_USER are only used if the directories they specify actually exist. So in addition to adding R_LIBS_USER to your .Renviron you need to create the directory as well. Once this is setup, the process for transferring your package library becomes. (assumes R_LIBS_USER is set to ~/Library/R/3.5/library).